The benefits of these motors provide the flexibility needed for challenging pump applications. In the early 1920s, California’s agricultural industry was booming. As the demand for the Golden State’s homegrown products increased, growers had to expand their operations, which in turn meant an increased demand for the state’s most valuable resource—water. The climate of Central and Southern California is ideal for agriculture. The only ingredient missing is rain. California’s rainfall is seasonal—dry during the hot summer months and wet for only a few winter months. The water in reservoirs, lakes and rivers was not sufficient to meet the drinking water demand, much less an added irrigation demand. One solution was to tap the groundwater supply. To do so required above-ground, horizontal pumps with right-angle gear configurations. They were powered by internal combustion engines. Many of the pumps were ditch pumps that only sent the water a short distance. The system worked, but end users became increasingly frustrated with efficiency issues and the higher costs associated with equipment losses. For instance, the ditch pumps’ bearings failed quickly because of the downward pull on the shaft. The farmers voiced those frustrations to pump manufacturers, who in turn looked to motor manufacturers for help. The solution came in 1922 when engineers from U.S. Electrical Motors—a small Los Angeles-based motor company—developed the first vertical pump motor. The motor revolutionized the pumping industry and made irrigating large areas of cropland possible. This innovation helped make California the nation’s top farming state, despite its limited water resources. 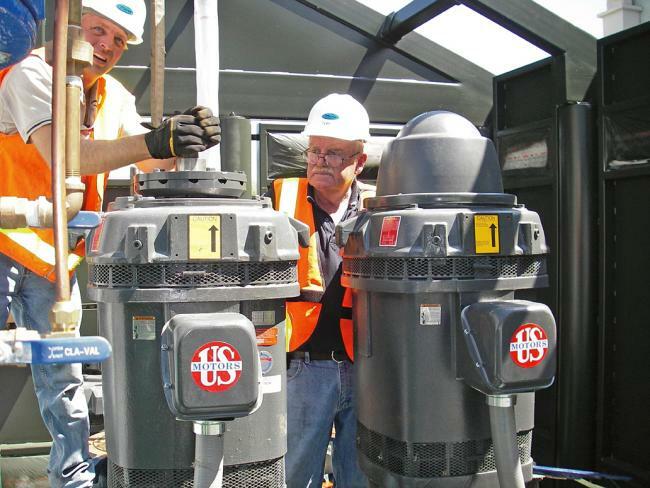 Vertical hollow shaft motors operating in the Metro Irrigation Efficiency Program project in Denver, Colo. Putting an electric motor on top of a pump solved three critical issues facing customers: convenience, costs and reliability. By marrying a vertical motor with a vertical pump, the need for the mechanical gearbox, which provides the torque for a horizontal motor, is eliminated. Less equipment means easier installation and more space. Another added benefit is that a vertical motor makes the alignment of the motor shafts with the driven equipment much easier, which means less vibration. In addition to the cost savings from fewer parts, vertical pump motors operate more efficiently—as much as 30 percent higher—than horizontal motors, because the gear box is eliminated. Vertical motors also handle more pump thrust, which eliminates the need for external thrust bearings. Because vertical motors are specifically designed for the pump application, they deliver better durability and reliability than their horizontal counterparts, which of course leads to greater peace of mind for the customer. Vertical motors are specifically designed to drive vertical turbine pumps. There are two types of vertical pump motors—solid shaft and hollow shaft. The solid shaft is coupled to the pump shaft by an externally-mounted coupling. Hollow shaft motors allow the pump head shaft to extend through the motor shaft and connect to an integrally-mounted drive coupling. Is a non-reverse ratchet required? The magnitude and direction of the thrust are determined by the pump and the dynamics of the liquid flow. Even when a system is designed for thrust in one direction, transient conditions will sometimes temporarily change the thrust direction. Thrust is then defined as either up thrust or down thrust.